Today’s Airfare of the Day goes to Delta basic season instant purchase non-refundable Economy Class fares between Seattle and Shanghai. 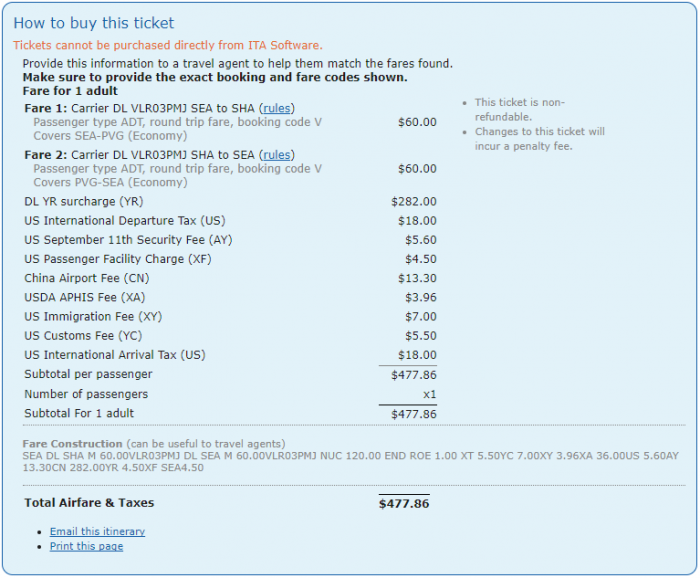 For Delta SkyMiles members, a round-trip travel SEA-PVG on this fare would obtain 2010 miles (5 miles per USD spent on airfare + carrier imposed surcharges) and 11444 MQMs. Mileage accrual for SkyTeam partners was estimated using wheretocredit and without considering any elite status bonuses. The most attractive part of this fare is probably that it can be routed on a direct flight SEA-PVG for cheaper than any other airline that would include at least 1 stop. Previous articleReader Question: Has IHG Changed The Age What Constitutes Child Without An Announcement?